The mean age was 56.0 ± 12.0 years and 70% were male. The baseline demographic data between the two groups are shown in [Table 1]. The hydration parameters at baseline and at 6 months and their comparison between the two groups are shown in [Table 2]. [Figure 1] shows the distribution of underhydration, normal hydration and OH at baseline and at 6 months between the two groups. 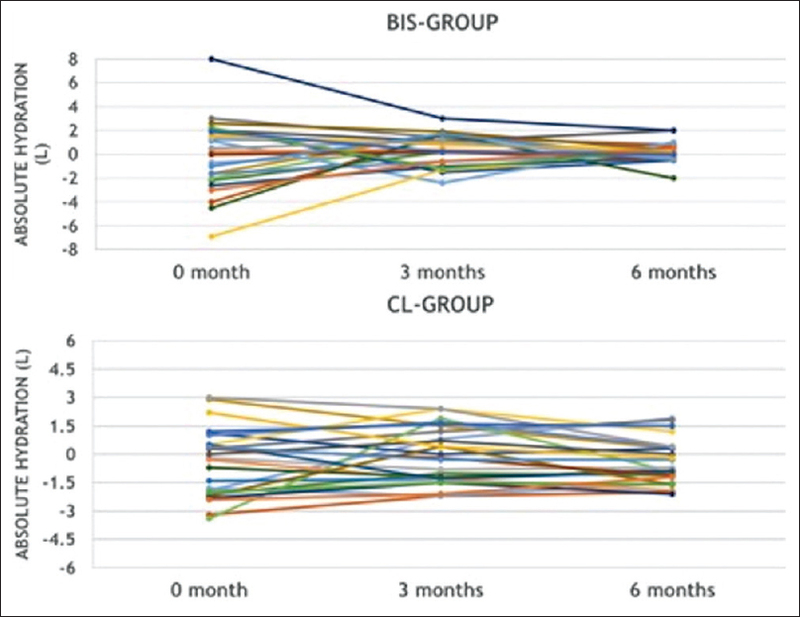 The distribution of relative OH (OH/ECW >15%) was 3 (12%) in both CL-group and BIS-group at baseline and none in CL-group and 1 (4%) in BIS-group at 6 months. 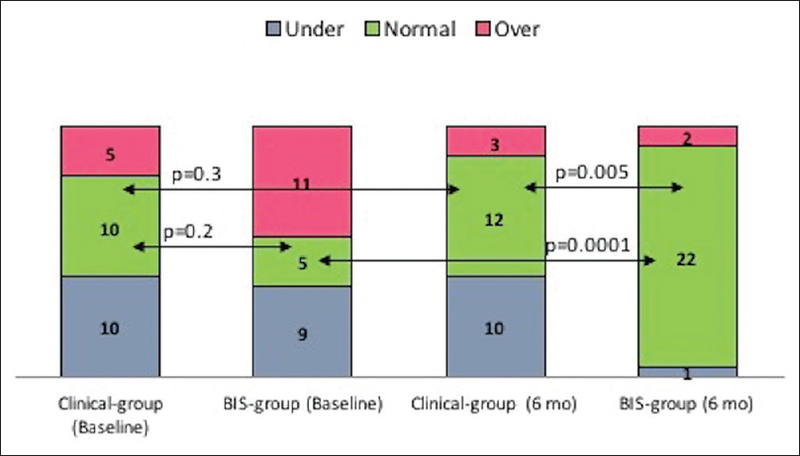 [Figure 2] shows the change in the absolute OH from baseline to 3 and 6 months in two groups. The absolute hydration (L) at baseline was −0.42 ± 1.8 and −0.084 ± 3.0 (0.63) in CL and BIS groups, respectively, at 3 months was −0.08 ± 1.5 and 0.47 ± 1.3 (0.17) in CL and BIS groups, respectively and was −0.44 ± 1.2 and 0.16 ± 0.8 (p = 0.04) in CL and BIS groups, respectively. 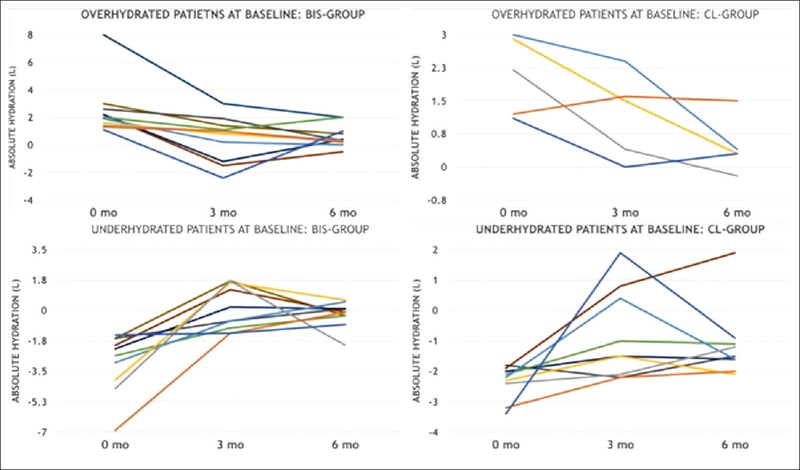 [Figure 3] shows details of change in hydration status over a period of 3 and 6 months in patients who were overhydrated and underhydrated at baseline in CL and BIS groups. [Table 3] shows the intradialytic adverse events between the two groups during the study period of 6 months. The comparison of BP measurements and antihypertensive medications at baseline and at 6 months is shown in [Table 4]. The SF-36 scores were similar between two groups at 6 months. OH determined by BIS is reported to be common in HD patients, with a reported incidence of approximately 22–35%., However, BIS measurements in these studies were done pre-dialysis, whereas we measured hydration status post-HD. We believe that the dry weight is essentially a post-dialysis weight, which represents normal hydration and hence measuring pre-dialysis BCM to measure hydration status is irrational. It is desirable to wait for half an hour post-HD to measure BCM to allow the fluid shifts to equilibrate. Though this is not formally studied, it is accepted that the fluid shift occurs much more rapidly than small solutes and the equilibration of small solutes occurs within half an hour after HD. The studies to assess hydration status using BIS have not given much attention to underhydration and our study is the first to quantify the underhydration status after HD session. The high incidence of underhydration at the end of HD in our study at baseline which remained unchanged in CL-group is likely to be the result of aggressive application of probing dry weight in our study population, which is likely to cause more harm. We caution against the aggressive pursuit of probing dry weight, which could result in chronic underhydration as seen in study population. Wabel et al. reported underhydration (OH <−1.1 L) in 5.4% of patients, but their assessment was done pre-HD. Blumberg A, Nelp WB, Hegstrom RM, Scribner BH. Extracellular volume in patients with chronic renal disease treated for hypertension by sodium restriction. Lancet 1967;2:69-73. Henderson LW. Symptomatic hypotension during hemodialysis. Kidney Int 1980;17:571-6. Charra B, Bergström J, Scribner BH. Blood pressure control in dialysis patients: Importance of the lag phenomenon. Am J Kidney Dis 1998;32:720-4. Agarwal R, Bouldin JM, Light RP, Garg A. Probing dry-weight improves left ventricular mass index. Am J Nephrol 2011;33:373-80. Chazot C, Wabel P, Chamney P, Moissl U, Wieskotten S, Wizemann V, et al. Importance of normohydration for the long-term survival of haemodialysis patients. Nephrol Dial Transplant 2012;27:2404-10. Kalantar-Zadeh K, Regidor DL, Kovesdy CP, Van Wyck D, Bunnapradist S, Horwich TB, et al. Fluid retention is associated with cardiovascular mortality in patients undergoing long-term hemodialysis. Circulation 2009;119:671-9. Davenport A, Cox C, Thuraisingham R. Achieving blood pressure targets during dialysis improves control but increases intradialytic hypotension. Kidney Int 2008;73:759-64. Owen PJ, Priestman WS, Sigrist MK, Lambie SH, John SG, Chesterton LJ, et al. Myocardial contractile function and intradialytic hypotension. Hemodial Int 2009;13:293-300. Dasselaar JJ, Slart RH, Knip M, Pruim J, Tio RA, McIntyre CW, et al. Haemodialysis is associated with a pronounced fall in myocardial perfusion. Nephrol Dial Transplant 2009;24:604-10. McIntyre CW, Harrison LE, Eldehni MT, Jefferies HJ, Szeto CC, John SG, et al. Circulating endotoxemia: A novel factor in systemic inflammation and cardiovascular disease in chronic kidney disease. Clin J Am Soc Nephrol 2011;6:133-41. Chang TI, Paik J, Greene T, Desai M, Bech F, Cheung AK, et al. Intradialytic hypotension and vascular access thrombosis. J Am Soc Nephrol 2011;22:1526-33. Shoji T, Tsubakihara Y, Fujii M, Imai E. Hemodialysis-associated hypotension as an independent risk factor for two-year mortality in hemodialysis patients. Kidney Int 2004;66:1212-20. Stefánsson BV, Brunelli SM, Cabrera C, Rosenbaum D, Anum E, Ramakrishnan K, et al. Intradialytic hypotension and risk of cardiovascular disease. Clin J Am Soc Nephrol 2014;9:2124-32. Sands JJ, Usvyat LA, Sullivan T, Segal JH, Zabetakis P, Kotanko P, et al. Intradialytic hypotension: Frequency, sources of variation and correlation with clinical outcome. Hemodial Int 2014;18:415-22. Burton JO, Jefferies HJ, Selby NM, McIntyre CW. Hemodialysis-induced repetitive myocardial injury results in global and segmental reduction in systolic cardiac function. Clin J Am Soc Nephrol 2009;4:1925-31. Eldehni MT, McIntyre CW. Are there neurological consequences of recurrent intradialytic hypotension? Semin Dial 2012;25:253-6. Moissl UM, Wabel P, Chamney PW, Bosaeus I, Levin NW, Bosy-Westphal A, et al. Body fluid volume determination via body composition spectroscopy in health and disease. Physiol Meas 2006;27:921-33. Wabel P, Chamney P, Moissl U, Jirka T. Importance of whole-body bioimpedance spectroscopy for the management of fluid balance. Blood Purif 2009;27:75-80. Chamney PW, Krämer M, Rode C, Kleinekofort W, Wizemann V. A new technique for establishing dry weight in hemodialysis patients via whole body bioimpedance. Kidney Int 2002;61:2250-8. Chamney PW, Wabel P, Moissl UM, Müller MJ, Bosy-Westphal A, Korth O, et al. A whole-body model to distinguish excess fluid from the hydration of major body tissues. Am J Clin Nutr 2007;85:80-9. Wabel P, Moissl U, Chamney P, Jirka T, Machek P, Ponce P, et al. Towards improved cardiovascular management: The necessity of combining blood pressure and fluid overload. Nephrol Dial Transplant 2008;23:2965-71. Machek P, Jirka T, Moissl U, Chamney P, Wabel P. Guided optimization of fluid status in haemodialysis patients. Nephrol Dial Transplant 2010;25:538-44. Hur E, Usta M, Toz H, Asci G, Wabel P, Kahvecioglu S, et al. Effect of fluid management guided by bioimpedance spectroscopy on cardiovascular parameters in hemodialysis patients: A randomized controlled trial. Am J Kidney Dis 2013;61:957-65. Onofriescu M, Hogas S, Voroneanu L, Apetrii M, Nistor I, Kanbay M, et al. Bioimpedance-guided fluid management in maintenance hemodialysis: A pilot randomized controlled trial. Am J Kidney Dis 2014;64:111-8. Charlson ME, Pompei P, Ales KL, MacKenzie CR. A new method of classifying prognostic comorbidity in longitudinal studies: Development and validation. J Chronic Dis 1987;40:373-83. Association of Physicians of India. Indian guidelines on hypertension (I.G.H.) – III 2013. J Assoc Physicians India 2013;61:6-36. Velasco N, Chamney P, Wabel P, Moissl U, Imtiaz T, Spalding E, et al. Optimal fluid control can normalize cardiovascular risk markers and limit left ventricular hypertrophy in thrice weekly dialysis patients. Hemodial Int 2012;16:465-72. Wizemann V, Wabel P, Chamney P, Zaluska W, Moissl U, Rode C, et al. The mortality risk of overhydration in haemodialysis patients. Nephrol Dial Transplant 2009;24:1574-9. Tattersall JE, DeTakats D, Chamney P, Greenwood RN, Farrington K. The post-hemodialysis rebound: Predicting and quantifying its effect on Kt/V. Kidney Int 1996;50:2094-102. Onofriescu M, Siriopol D, Voroneanu L, Hogas S, Nistor I, Apetrii M, et al. Overhydration, cardiac function and survival in hemodialysis patients. PLoS One 2015;10:e0135691. Kim YJ, Jeon HJ, Kim YH, Jeon J, Ham YR, Chung S, et al. Overhydration measured by bioimpedance analysis and the survival of patients on maintenance hemodialysis: A single-center study. Kidney Res Clin Pract 2015;34:212-8.